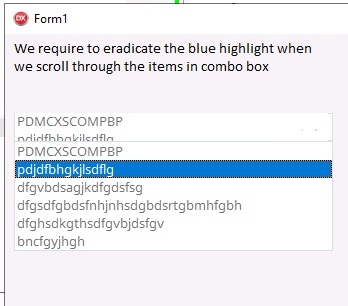 We require to replace the blue highlight when we scroll through the items in combo box. I tried a sample code to handle the border of the combo drop down, The below is my sample application code. PDMCXSComboBox is my custom component derived from tcxcombobox. I have fixed the issue and it is working as expected. The only thing i did is I have handled OnDrawItem twice, So I have to disable this at component designing. Not the answer you're looking for? Browse other questions tagged delphi devexpress vcl delphi-10.2-tokyo or ask your own question.